Watercress is a succulent, perennial plant that is cultivated for its leaves, which are principally used as salad greens or garnishes. Forms large colonies in cool running water; a creeping, weak, stem with root at the nodes and turns up to form leafy shoots, 1-2 feet in length, generally extends with its leaves above the water. The smooth, somewhat fleshy, compound, dark green leaves are odd-pinnate with 1-4 pairs of small, oblong or roundish leaflets. The small, white or pale purple, four-petaled flowers bloom in elongating terminal racemes from May to September. The fruit is a long, curved, linear-cylindric, partitioned pod borne more or less upright. Native to Europe and naturalized in the United States and some parts of Canada. It thrives in clear, running, cold water and is found in ditches, springs, and streams everywhere. Widely cultivated for use in salads. Calcium, chlorine, cobalt, copper, tannin, fluorine, iodine, iron, manganese, phosphorus, sulfur, vanadium, vitamins A, B1, B2, C, D, and zinc. Watercress is high in favor with nutritional advisors to the armed forces for soups and salads for the energy it produces. Good for dieters, has low carbohydrate content and more iron than spinach. Fed to children with weak bones and soft teeth because it contains lime high in sulphur content. Given in tablet form for eczema. Good for urinary bladder problems. Promotes kidney function. Helps heart disease by relieving fluid retention. Relieves indigestion and stops gas formation. Stimulates rate of metabolism and is taken as a spring tonic. 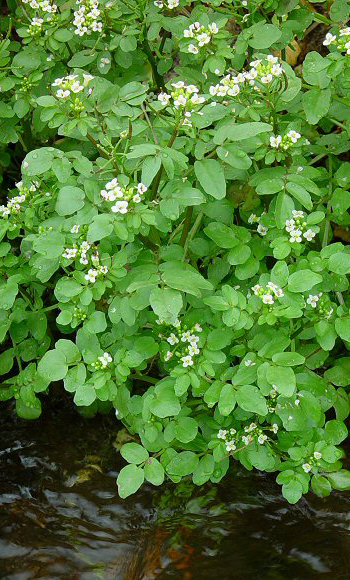 Watercress is recommended for gout, scurvy, mild digestive disturbances, anemia, and catarrh of the upper respiratory tract. Very effective as an expectorant, it is also beneficial for tuberculosis, scurvy, anemia, and eczema. Its high vitamin C content makes it a good illness preventative. Very good as a post-partum (after childbirth) remedy to prevent infections. Having a modest iodine content, cress is a dietary remedy for thyroid problems. The iodine in watercress is present in the right amount and combination with other substances. If you have thyroid problems, such as palpitations, oversensitivity to every little influence, or enlargement of the gland itself, you should definitely eat watercress on a regular basis. You will find it a marvelous remedy if you lack vitality and are always listless and tired, symptoms that are usually caused by the poor function of the endocrine glands. In addition, the richness of its mineral, iron and iodine content stimulates glandular activity. Limited loss of hair caused by a fungus can be remedied by an application of watercress juice. Leaf extracts are used clinically in India to correct vitamin deficiency. Watercress stimulates the appetite. Fresh leaves may be used in salads or as a garnish, raw or deep-fried. Also in chopped form, added to appetizers, eggs, cheese, and fish. Watercress must be used fresh. Infusion: use 1 tsp. young shoots in 1/2 cup water. Take 1/2 cup, freshly made, 3 times a day. To maintain the greatest possible vitamin content, do not steep a long time or allow to boil. Juice: take 1 tsp. in milk or water, 3 times a day. Fresh watercress juice is easily obtained with an electric vegetable juicer. Iodine, niacin, magnesium, manganese, phosphorus, calcium, vitamins A, B1, B2, C and E and zinc. Do not harvest leaves from polluted waters. Poisonings have resulted from eating leaves from plants growing in polluted waters, from which the plant has absorbed heavy metals and toxins. Excessive or prolonged use can lead to stomach upset and kidney problems. It should not be taken daily and no longer than 4 weeks even with interruptions. The juice should not be taken undiluted, because it can produce inflammations in the throat and stomach. Some doctors caution against use during pregnancy.